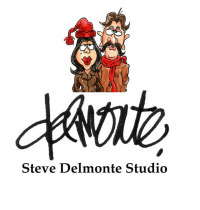 About Me: I've been a professional Cartoonist and Humorous Illustrator for over 30 years. My work has appeared in many magazines and ads as well as books. Places that my work have appeared are - Woman's World, First, Penthouse, Scholastic, Barron's, Reader's Digest, Field & Stream. I also do Caricatures at parties, meetings, batmizvahs. My Interests: Juggling rings, balls, clubs, torches and the occasional cat! Hi, Thanks for dropping by! I hope you enjoy my work and come back often, as I will be putting up more cards. If there's something special you need just let me know, I will try to fill your needs. Thanks again. Love, love your characters! Keep up the good work. Thanks also for your kind card review on my triplets card. Have fun creating! Hi Steve, you have some of the funniest, smartest cards on GCU. Love your style! Steve you need a warning up in your store........Caution: Do not read these cards while drinking coffee!!!!! Thank you Steve for your quick response and how quickly you customized two cards for me. Very funny and creative! I actually laughed out loud. Seriously. I adore these, they remind me of the sea side ones we got when I was little, naughty but soooo nice. Fantastic store... unique and so creative!